The Buccos and Neal Huntington just wrapped up another trade with frequent partner Brian Cashman, dealing journeyman infielder Eric Hinske to the New York Yankees for two minor leaguers, outfielder/catcher Eric Fryer and RHP Casey Erickson. Hinske was batting .255 with a .373 OBP, 1 HR and 11 RBI for the Pirates. The 2002 AL Rookie of the Year, who's also suited up for Toronto, Boston, and Tampa, now only needs to play for Baltimore to complete the tour of the AL East. The 23-year-old Fryer will be assigned to advanced Class-A Lynchburg. He was hitting .250 with 11 doubles, two HR, 24 RBI and 34 runs scored in 59 games with Single-A Tampa. 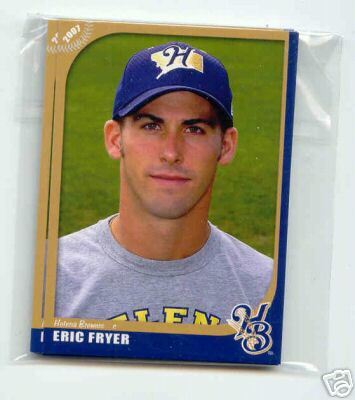 Last year, Fryer led the South Atlantic League with a .335 average and .407 on-base percentage. So it looks like he's got some upside, although it may be years away. Erickson, also 23, was 3-3 with a 2.25 ERA for Single-A Charleston this season. In his 18 relief appearances, he's whiffed 33 batters in 32 2/3 innings, while allowing only four earned runs. He will join the Pirates' West Virginia affiliate. OF Garrett Jones will take Hinske's spot on the Bucco roster. Jones was was batting .307 with 18 doubles, 12 home runs, 48 RBIs and 14 stolen bases in 72 games with Indianapolis. The Pirates signed Jones to a minor league contract following the 2008 season. 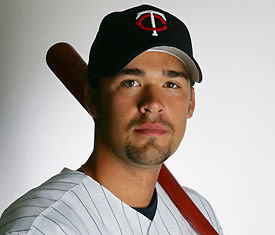 In his only MLB experience, he hit .208 with a .262 OBP, 2 HR and 5 RBI in 84 at-bats for the Twins in 2007. In the end, it was a typical Huntington trade: one veteran for multiple building blocks. He continues to acquire depth, and someday (I hope), we'll begin to see the dividends. Hinske was not doing much and had no real future with the Pirates, so at first glance, this looks like a good trade to me. way to go neal. trade the cornerstone of our dugout! jk, not a bad trade at all. Such a lackluster, nothing for nothing, wet fart of a trade, yet it shows up as news on ESPN's front page simply because the blessed Yankees were involved. On the flip-side, the Pirates are so lame that they could hold 7th inning player executions and it wouldn't generate a pulse in the sporting world. The Pirates' yearly firesale started early this season. The Pirates and Washington have agreed in principle to a trade that would send outfielder Nyjer Morgan and reliever Sean Burnett to the Nationals for outfielder Lastings Milledge and reliever Joel Hanrahan. That is what I was referring to, I guess we can only have one headcase on the Major League roster at a time so Snell will continue to fan minor leaguers and act like he is Nolan Ryan. Weirdo, I guess I copy/paste faster. Anyway, Isn't this becoming more than a coincidence that the Pirates are making player transactions at the same time as the Pens? Same thing happened last year I thought. Do the Pirates get confused with the July 1st NHL FA signing deadline? Someone needs to tell them the are not in the NHL, although they might as well play with a puck too. Maybe it's easier to hit. I wouldn't be totally shocked to learn that Pirates management was confused as to what sport they are supposed to be fielding a team for. BTW, Am I the only one who reads the comments on the THE PBC BLOG and think that those readers are merely Pirates front office interns trying to spin everything in a favorable direction? This just seems weird. The Pirates are on the receiving end of another team's fire sale (the Nationals). It seems the Bucs and Nats have out-dumbed each other by trying to offload each other's garbage. for whatever reason, i just keep thinking that the pirates final record wont be as bad as everyone says it will be. i'm not saying playoffs. but i dont think that a 75 win season is completely out of the question. A healthy and productive ryan doumit could make this team hover around the .500 mark. jack wilson should be the next guy to go as far as getting the most in return, then adam laroache. I honestly don't understand why anybody cares about the Pirates or goes to their games. Unless there are fireworks or a really awesome band like LIVE playing after the game, you have to be insane to support these idiots.